The Simpsons: Bart vs. 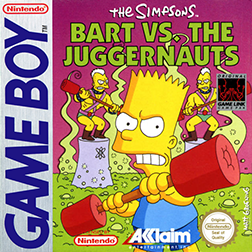 The Juggernauts is an video game released in 1992 for the Game Boy. It was developed by Imagineering and published by Acclaim. The plot stars Bart Simpson in a game show, Juggernauts USA, in which he has to compete in challenges to earn money. Each of the four levels are made up of an episode of Juggernauts USA, and every challenge is based on a character from The Simpsons. For example, there is one challenge in which Bart has to run an obstacle course in the Kwik-E-Mart, another being Dr. Marvin Monroe's "Hop, Skip and Fry", in which Bart jumps on a floor of tiles that randomly shifts from being safe to electrifying. The others include basketball, skateboarding, a juggernaut fighting match, and a match of shoving at Moe's Tavern. Kent Brockman and Marvin Monroe are the game show's commentators and after the completion of a challenge they comment on Bart's performance. Modified on July 28, 2015, at 18:33.